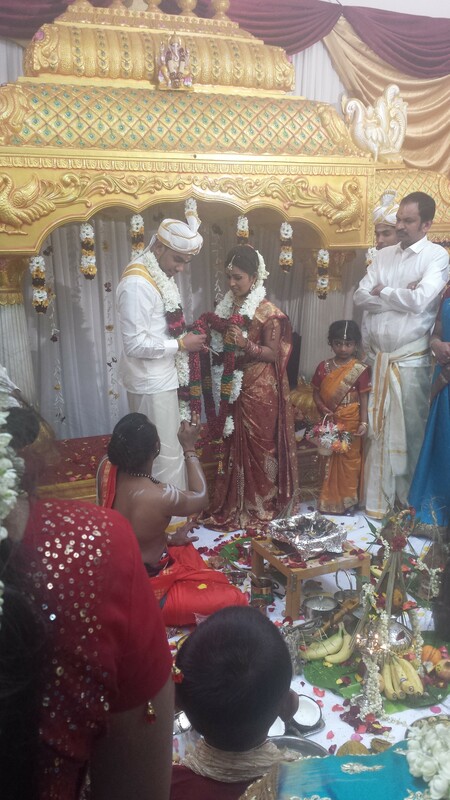 My 1st South Asian Wedding Experience! 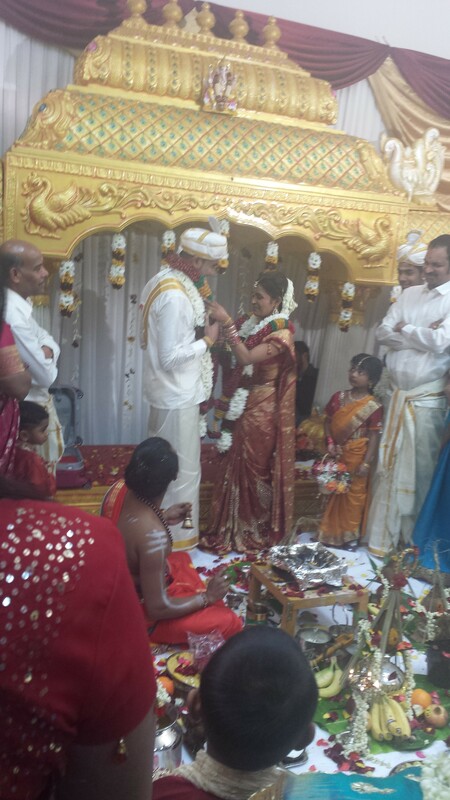 In February 2014; the month of pyaar, my dear old school friend invited me to her South Asian Hindu wedding. I was very flattered for the invite and indeed very excited to see my old school friend getting married after being with her partner for 4 years! 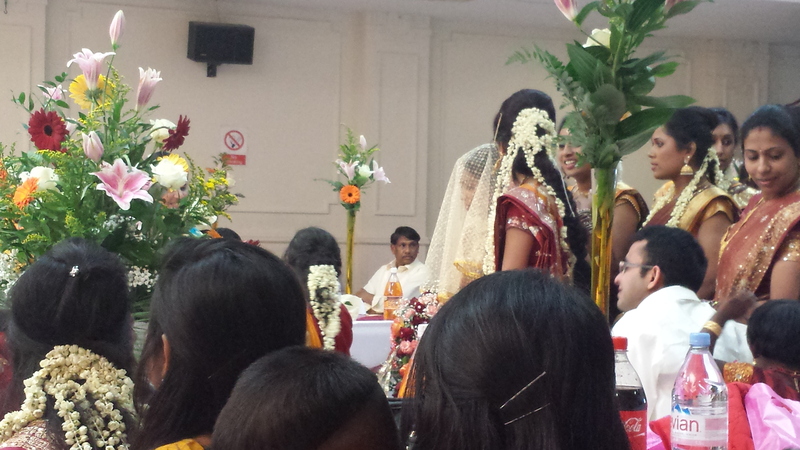 It was a small wedding, in the small town of Tooting with a traditional set up. 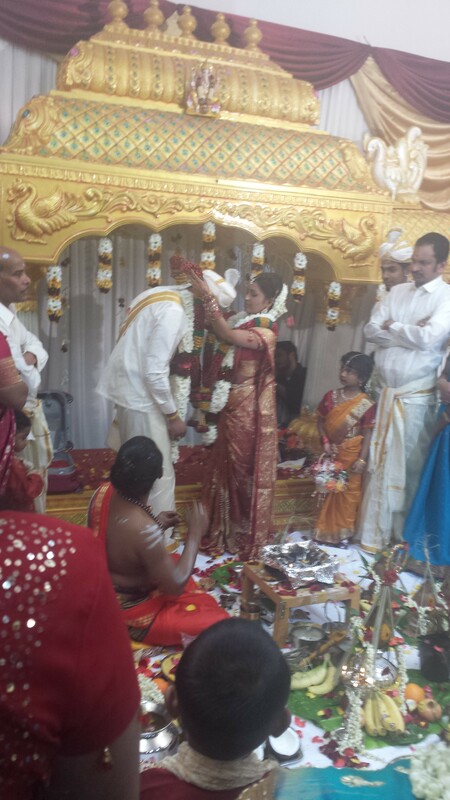 I actually realised there was quite a lot of similarities between the South Asian Hindu and Gujarati/Bengali Hindu wedding ceremonies. 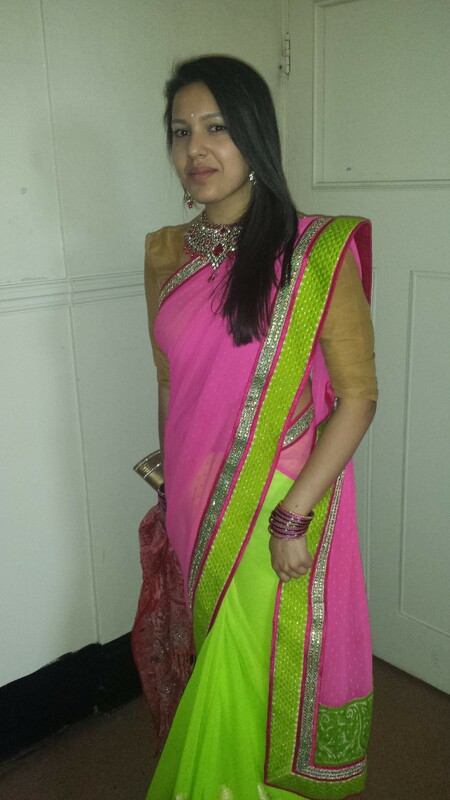 A South Asian wedding meant traditional silk sari attire is normally worn, however I opted in for a contemporary georgette with the neon pink & lime green sari. Unfortunately I was unable to tailor the dark pink raw silk blouse in time (the actual blouse which came with the sari), which I therefore had to pair this saree with a small tight cotton blouse my mum last wore about 30 years ago! The beige “goldish” blouse and sari combination I believed worked okay together. The sari has a neon green embroidery stitched thick border and gorgeous shimmery gold prints on the bottom half. This beautiful sari number I found at Seema Silk Sarees (one of my favourite Asian Fashion stores…a great place to find those one-off contemporary pieces, however this comes down to luck and looking in the store with a fine eye). I love big necklaces… so I purchased this gold & pink gem necklace from good old Venisons. I loved the design of the earrings, as they are not your conventional tear-drop style earrings. The bangles I wore consisted of simple plastic bangles for a bargain of £1 the rest I used mixing other pink bangles I already owned (from Wembley).